The Yangtze giant softshell turtle was believed to be over 90 years old. 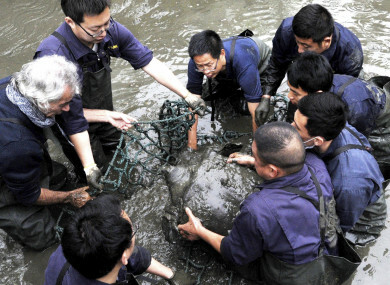 Researchers lift the turtle out of the water. The Yangtze giant softshell turtle is the largest freshwater turtle in the world, growing to up to a metre long and weighing up to 100kg. Email “World's rarest turtle almost extinct as final known female dies after 'last-ditch insemination'”. Feedback on “World's rarest turtle almost extinct as final known female dies after 'last-ditch insemination'”.